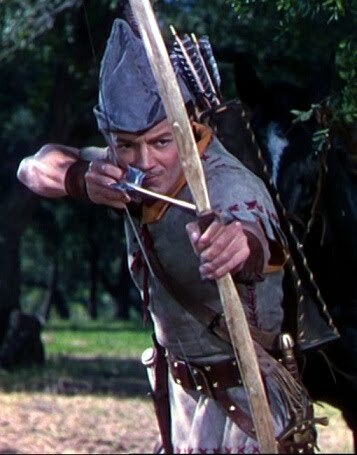 Above: Cornel Wilde as Robert, Son of Robin Hood. Robin Hood, now the silver haired Earl of Huntingdon some 20 years after his exploits as the legendary outlaw of Sherwood Forest, learns that The Regent William of Pembroke is scheming to revoke the Magna Carta. The aging Robin argues against Pembroke and as a consequence is outlawed, whilst the Boy King is also kidnapped by Pembroke from the Queen. And so it is that Robin Hood / Earl of Huntington calls together his outlaw gang of old (seeming hundreds of whom come charging out of Sherwood Forest riding stallions and looking like a cross between the 7th Cavalry and Geronimo’s Apaches), whilst the Queen and Lady Catherine take shelter with the “old hag” Mother Meg. 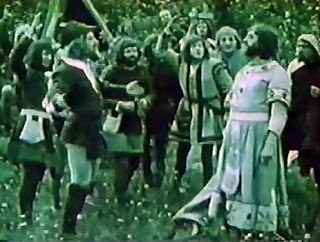 Above: An aging Robin Hood with Merry Men Little John and Alan A Dale. 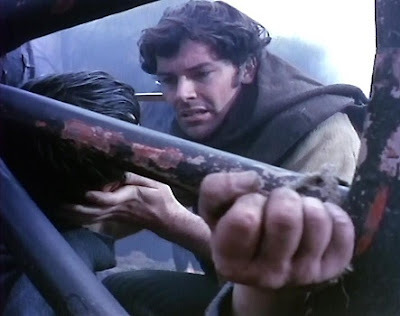 The actual hero of the film is Robert Hood, son of Robin, who in time honoured tradition proves his strengths in a good hearted sword fight with Friar Tuck. 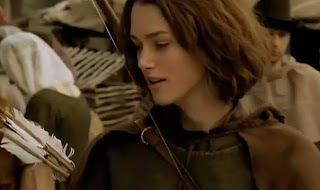 This idea of making the son of Robin Hood the central character will be used again in 1950’s “Rogues of Sherwood Forest”. 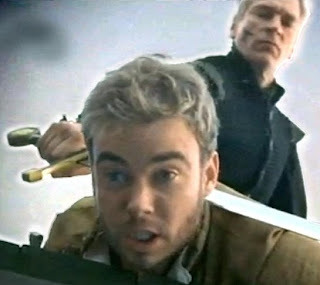 However, the difference here is that the original, aging Robin Hood is still alive and fights alongside Robert. Above: The original Robin Hood as earl of Huntington. It would be easy to be cynical about the Bandit of Sherwood Forest, especially Cornel Wilde’s padded shoulders and huge pointy hat which make him look like Peter Pan on steroids. Also, note how in 1946 it was perfectly acceptable for the hero to creep up on a girl he’d never met, spy on her bathing, then forcibly kiss her, all within the space of about 60 seconds, only to have her fall instantly in love with him. However, I found it to be an enjoyable, well crafted, colourful adventure, in which all the legend’s main characters are present. 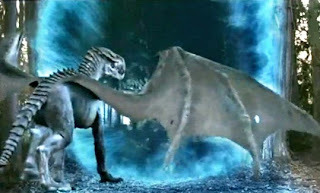 (Apart from Marian, where there is an almost unspoken implication that Robert was raised by the “old hag” Mother Meg). As with the aforementioned “Rogues of Sherwood Forest”, “Bandit of Sherwood Forest” is intended to be seen as a possible sequel to the Errol Flynn classic, and comes complete with an attempt to duplicate the former film's staircase duel at the end. 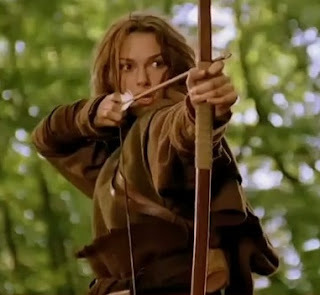 Without specifically saying so, “Rogues of Sherwood Forest” suggests itself to be a kind of sequel to the “Adventures of Robin Hood”, and features the son of Robin Hood. This conception is given added credence with the repeat performance by Alan Hale as Little John. (This was Hale’s third performance in the role, the first being the Douglas Fairbanks version. Sadly, it would also prove to be his final film). However, this being 1950 Hollywood, no specific details are given regarding his father’s marriage to a Marian, or how babies might be made. (Note: In 1939, Tarzan and Jane could not be filmed as a married couple in the jungle and had to “find” a son in the wreckage of a plane in “Tarzan Finds A Son”.) Similarly, the “Marian” in this story is the conveniently similarly named Marianne de Beaudray. But don’t let any of that put you off. The plot involves Little John and young Robin, Earl of Huntingdon, returned from the Crusades and living in an England ruled by King John. 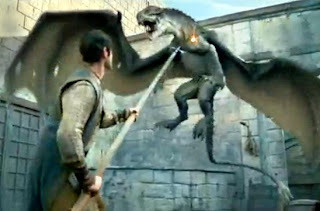 The King holds a grudge against Robin because of his father’s exploits as the original Robin Hood, and so arranges a jousting contest in which the young Earl is meant to be killed. Needless to say, after some flirting with Lady Marianne, Robin survives the contest. King John is having trouble enforcing his rule in England, and needs more troops to impose his will on the people. He seeks to buy Flemish troops from the Count of Flanders, but to do so he must raise the money by introducing punitive taxes. When Robin opposes him he is outlawed and his lands confiscated. Robin then responds by becoming the outlaw his father once was and, at Little John’s suggestion, gathers together the original “merry men” (though not, it should be stressed, the original actors apart from Hale). And, of course, Marianne plays her part as an informant to the outlaws regarding the King’s plans. I thoroughly enjoyed the film. A colourful, light hearted piece of entertainment with all the iconic outlaws present, even if (as is the point), they are more advanced in years than most films depict them. 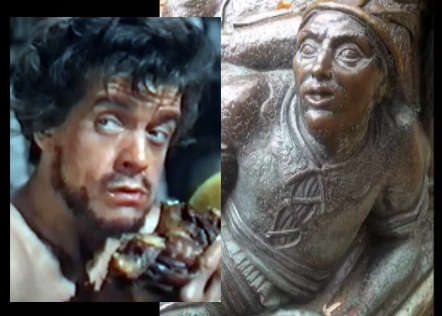 It would have been nice to hear how the original Robin had died (we don’t), and yes it is a bit strong to suggest King John signed the Magna Carter because of Robin Hood’s son. 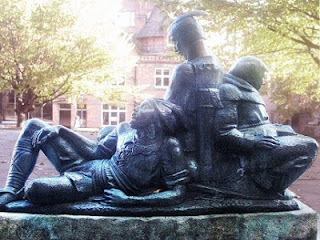 But hey, those fans who prefer their Robin Hood in such splendid attire, with lots of galloping of horses hooves through the forest, as lots of arrows find their targets in the chests of shiny helmeted soldiers, will find plenty to enjoy. I certainly did. 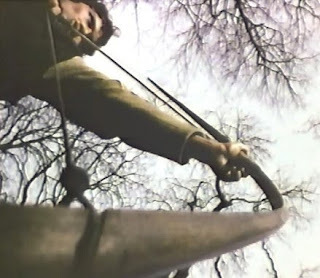 1953 was the year of the first televised version of Robin Hood. Directed by Joy Harington, six thirty minute episodes were broadcast live by the BBC from Gaumont-British Studios, London, from March 17 to April 21 of that year. Only one episode is believed to have survived. 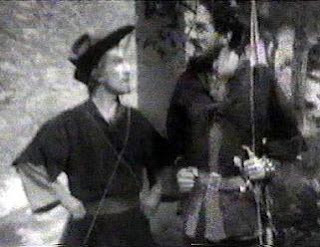 Patrick Troughton played the part of Robin Hood, opposite David Kossoff as the Sheriff of Nottingham. From what very little I've seen of the programme it would seem to have had a rather serious, sombre intent, but lacking the more stylish action of the Richard Greene series which was soon to follow. 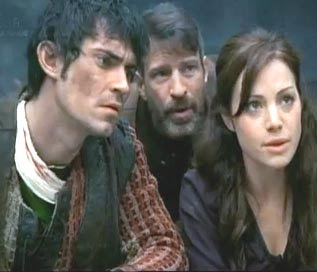 Of course, as we all know, Patrick Troughton went on to become Dr Who, whilst his grandson Sam Troughton would feature in Robin Hood in 2006. 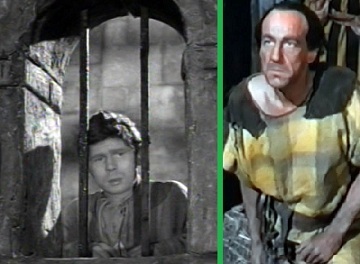 Above: Patrick Troughton as Robin Hood, with Kenneth MacKintosh as Little John. 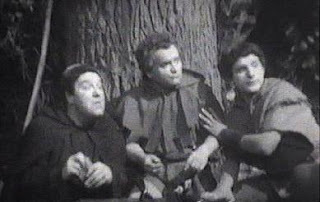 Below left: Wensley Pithey as Friar Tuck. Centre: Possibly Philip Guard as Will Scarlet. 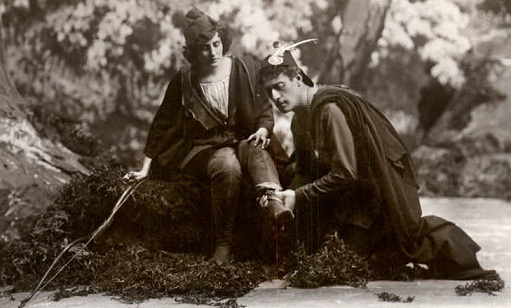 Right: Possibly John Breslin as Alan A Dale. The Douglas Fairbanks version of Robin Hood (1922) is not in all truth an artistic classic of the silent movie era. But it is certainly a huge spectacle, and was designed as such to appeal to a public which had previously flocked to see him in his first historical action adventure film "The Mark of Zorro". This was a time when a cast of a thousand extras, and huge theatrical sets, provided the backdrop to Fairbanks's swashbuckling style as he produced and directed himself through a series of box office smashes. 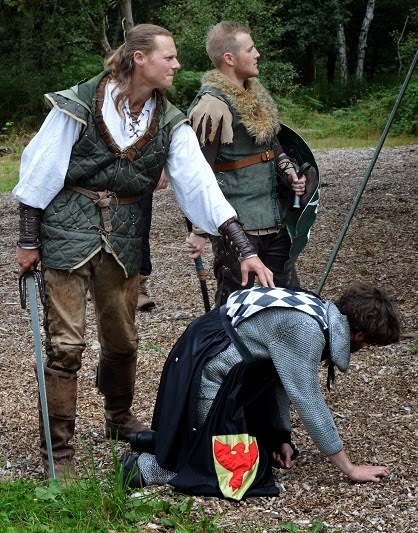 The first part of the film concentrates on the Earl of Huntingdon as he becomes King Richard the Lionheart's favoured knight, beating the cheating Guy of Gisborne in a jousting tournament, and accompanying the King as they depart for the Crusades. The night before their departure the Earl of Huntingdon meets Lady Marian, having to rescue her from the advances of Prince John. This makes him both the enemy of the Prince and Guy, the latter of which has desires of his own for Marian. No sooner has the King's Army departed for the Crusades than Prince John and Guy of Gisborne begin to terrorise the countryside in their attempt to take over the throne. Marian despatches the Earl's Squire (soon to become Little John), to tell both Huntingdon and King Richard of what is happening. But Huntingdon decides not to give the King the news for fear it will make him turn back from his task in the Holy Lands. So he "deserts" the King, returning to England to deal with the matter himself. 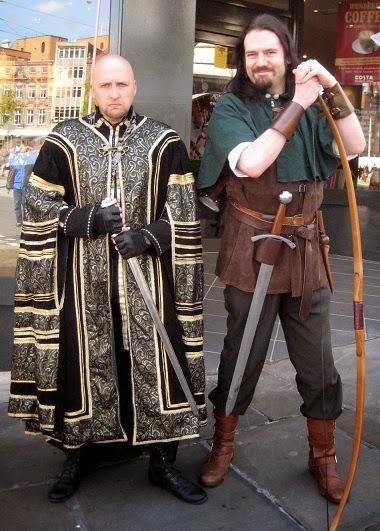 No sooner is the Earl back in England than mysterious arrows (accompanied by gusts of wind), appear out of the forest, cautioning the movements of the Sheriff of Nottingham and all who are disloyal to the King. Sadly we never get to see how Friar Tuck, Alan A’ Dale, nor Will Scarlet join the Merry Men. 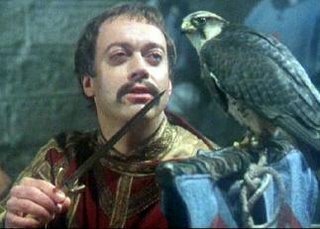 And of course there is no legendary encounter on the bridge with Little John because he is already Robert Huntingdon's Squire. What we do get is much prancing through the forest, accompanied by a histrionic waving of arms, as if to drive home the none too subtle point that these Men are indeed Merry. The best silent films are neither this crude nor this obvious. Douglas Fairbanks was a slightly portly 39 when he made "Robin Hood". To be honest he looks older. Of interest to Robin Hood fans is the fact that Little John is played by Alan Hale, the same actor who played the part opposite Errol Flynn in The Adventures of Robin Hood (1938), upon which the Fairbanks style was a notable influence. 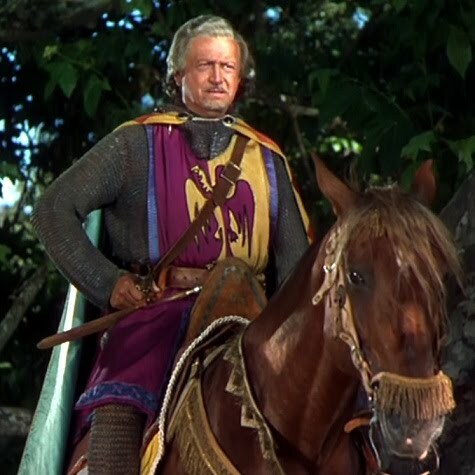 (Alan Hale would play Little John a third time in "Rogues of Sherwood Forest", 1950.) 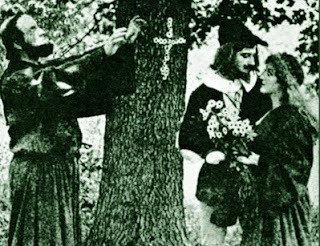 The 1922 silent version of "Robin Hood" was a huge commercial success. The fact it has aged so badly has nothing to do with the absence of sound. More pictures from this film on THIS LINK. See Robin Hood even BEFORE silent movies were invented on THIS LINK. When Michael Praed made the somewhat dubious career move of leaving Robin of Sherwood for a bit part in an ailing American soap opera, he obviously created something of a dilemma for the continuity of the series. The solution the producers came up with was however totally in line with the basic premise of the story; that Herne's son is a chosen one, and not a birthright title. 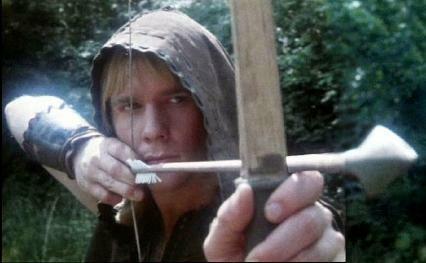 So it was that after the death of Robin of Loxley, the mantle of the Hooded Man passed to Robert of Huntingdon. Nevertheless, no matter how logical that solution, the general public (and a significant number of fans), did not readily take to the substitution of their hero with a bleach blonde Robin Hood, and Jason Connery had not only to live up to the expectations of a role developed by Praed, but an audience keenly aware that his dad was James Bond. 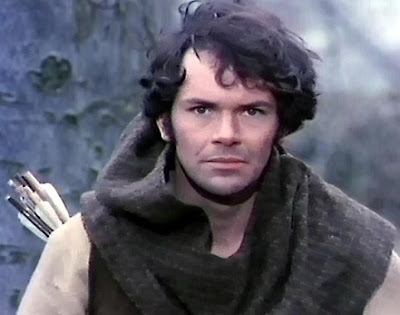 Thanks to the DVD boxed set collection Robin Hood fans like me, who were more than uncertain at the time regarding the Jason Connery series, can look back and lay such apprehensions to rest. Richard Carpenter's writing in the third series of "Robin of Sherwood", especially in the initial three transitional programmes in which Jason Connery takes over the role, is if anything even better. Clive Mantle as Little John, certainly approaches his role with greater confidence and definition, more use is made of the popular Mark Ryan as Nasir, and the sets and locations show a continued high level of investment in the continued success of the series. The third series of Robin of Sherwood has aged well, continuing to set the bar high for those that follow. Recommended.